Lord Denovan is attemting to organise the set up of a REvenue Group in Scotland. If anyone is interested in attending this group which will cover Revenus Stamps / Imprints / Fiscal and Tax they should contact Lord Denovan either by e-mail or by phone. The post of Webmaster was set and Norman Kelso filled that position. David Millar and Doug Howkins became committee members replacing Norman Kelso and Peter Dix. At the final display meeting of the season the guest was Willie King from Ayrshire Philatelic Society. Willie presented his display of 'Ceylon', which luckily had just returned from being displayed in Milan. The display comprised stamps, covers and postcards starting with the Penny issues from the 1850's right through to issues from Edward VIII and George VI, including overprints, surcharges and variations in perforation and shade. At the latest meeting members were treated to a magnificent variety of displays from four members of Caledonian Philatelic Society. Starting the night off Ray Welland displayed a series of WWI Prisoner of War covers beginning at the time of the British Expeditionary Force arriving in France. The covers also included letters addressed to prisoners of war as well as from POW's. Second up was Lyn Robinson who provided a display on the development of mail coaches in the 18th and very early 19th Century by John Palmer. Ken Norris then provided a display of stamps and covers from 3 different Christmas Islands, one of which is in the Pacific, another in the Indian Ocean and a third which is on a peninsula in Nova Scotia, Canada. The final display was given by John Gavin and this was a collection of Stamps, tokens covers, christmas cards all of which were designed by Finnish Graphic designer Erik Bruun. The picture shows the members of the Caledonian Philatelic Society, Ken Norris, Lyn Robinson and John Gavin. At last night's meeting members were enthused by displays from members of Perth Philatelic Society. To begin the night Fraser Brown presented a display of stamps from Mexico with a theme relating to the revolution of 1910, which covered the 150th Anniversary of the Mexican American war, and stamps which also related to different parts of the mexican constitution. Next up was Norman Watson who displayed an exceptional set of postal mileage marks of Scotland between 1808 and 1829, when mileage marks were discontinued. Norman displayed a variety of types of mileage mark e.g. circular, boxed and unboxed marks. Larger cities also had dated marks and Norman also managed to display a few of these. Finally Paul Stephens gave members a display of Sudan Postal Stationery, which included overprints that arose as a consequence of rate changes. At the end of the meeting the current President Alan Roy presented the outgoing president Charles Lloyd with the customry tie to commemorate his time as President of the Society. Last night the society held its Annual Dinner at which a number of the members and their spouses attended. The dinner was held at 'The Tasting Rooms' in Dundee on a cold windy night, but the evening soon warmed up with good food, drink and great company, and a good night was had by all. At the latest meeting of the society members were treated to a display of 'Space' from Bob Catto of Edinburgh PS. Bob's display of stamps and covers began at the birth of rocket travel and the development and launch of the first satellite 'Sputnik' right through to the Apollo missions and the resultant moon landing and then on to the development of Skylab, and finishing with the joint missions of Apollo-Soyuz. Bob also pointed out the part of Skylab in which he personally had some involvement in the design and build which took up some 2 years of work. Last nights' meeting was a night for members to show off their displays all of which were based on a Valentine's theme, and 11 members rose to the ocassion to display an eclectic mix of postcards, stamps and envelopes all of which either had a love theme or were actual Valentine (post)cards, we even had a display of Titanic (well it did have a love theme to it). There were postcards from Singapore which were all marked 'with love', and we finished with pictures of the rebuilding of the Tay Rail Bridge following the disaster, which were recorded by Valentine's Engravers. At this latest meeting of the society last night 12 members put on very innovative displays of their items all of which had a 'J' theme attached to them, indeed there were some which stretched the 'J' theme imagination some way. Some of the items displayed were stamps from Indian states which began with the letter 'J', stamps from various countries which related to 'Jumping'. Postcards, covers etc from 'Jinja', which is in eastern Uganda, stamps relating to Juan Carlos of Spain, stamps and covers from Johannesburg, Jersey, Japan, Jerusalem and Jugoslavia, (I know that one's a bit of a stretch). Other ideas for display were Portuguese scientists whose name began with 'J', Norwegian stamps relating to Christmas (or Jule if you prefer), 20th Century Scottish handstamps with the initial 'J', stamp receipts from the Japanese occupancy of Singapore, and we even had a 'Jaunt' round Sierra Leone using postcards. Such was the level of entries that unfortunately not all could be mentioned. The first meeting of 2013 was the Annual Competition on 10th January at which a large number of members competed for one of the three shields on offer. The winner of the Thematic Shield was Colin Campbell with his entry of Communication. In a very close competition for the National and	General Shield 5 members submitted an excellent set of entries which included, Issues from Uganda 1996, Stamps from the Dominion of Ghana from 1957 to 1960 , Stamps from the Third Reich and Images from a Digital Microscope showing flaws, colour definition etc, with the winner being Peter Dix	with his entry of Booklet Stamps from GB machins. Again in another difficult to chose competition three members submitted entries for the Postal History Shield covering, The beginning of Colombia from the mid 1860's to the 1940's and Paquebot Cancellations with the winner judged to be George Lewthwaite with his entry of early postmarks from the 18th/19th Century from Caithness. Yet again members last night were treated to another superb display from This latest meeting on 20th December was the One-Sheet competition for members and a chance to show off their latest acquisitions. 10 members submitted a superb variety of entries for the competition. In third place was Doug Howkins with his entry about the British Postal Strike in 1971. Runner-up was Charles Lloyd with his entry of a cover sent from Mozambique via a flying boat. The winner of the bowl was Francis Podger with his entry of two covers recovered from an air crash in Singapore in 1954. In the second part of the meeting some of the members displayed their latest acquisitions for the other members to peruse..
At the last meeting on 6th December, in a change to the original programme, four local members presented displays from their own collections. Peter Dix displayed stamps from the Seychelles showing the history, politics and geography of the islands as well as the variety of plants and wildlife. Charles Lloyd showed part of his collection of postal stationery from the Belgian Congo from 1886 with interesting information on events which happened in WWI. Ron Goodfellow displayed a miscellany of pages including a letter possibly sent on the final complete vogae of the Lusitania, examples of postmarks from Liechtenstein, rocket mail and family correspondence. Sandy Sloss provided an insight into the historical development of Greece as a nation through his collection of stamps of 1924 to 1951. Pictured are the local members Sandy Sloss, Peter Dix, Charles Lloyd and Ron Goodfellow. Local member Francis Podger joins three other local members of the society in having the distinction of becoming a Fellow of the Royal Philatelic Society of London. Congratulations to Francis who also joins his father and brother who have already gained this distinction. Yet again members last night were treated to another superb display from Russell Walker of the Caledonian Philatelic Society. Russell's title for the evening was 'Sahara a'ra Camels' which undoubtedly gave some indication as to the content for the nights' entertainment. Russell displayed a variety of covers and material all of which had some relevance to the Sahara and surrounding countries, most of which had a military theme to it, including letters from possible legionairres involved in some of the conflicts. Members last night were treated to another superb display, this time from four members of Edinburgh Philatelic Society. In the first half Bob Catto presented a collection of recent issues of miniature sheets from Great Britain covering themes such as Royal Households, Castles, Machins and Celebrating Britain. This was followed by Irene Catto who displayed a Scandinavian themed miscellany of cards covering Sweden, Denmark and Finland. In the second session Sid Morgan presented a collection of stamps entitled 'Birds of the World' from a variety of different countries, and the evening finished off with Bill Black who presented a collection of Miniature sheets, stamps and covers all related to ANZAC Day,the highlight of which was a sheet of stamps commemorating each member of the New Zealand Armed Forces who has been awarded a Victoria Cross. Members have so far this year been treated to some excellent displays and this display again did not disappoint. Respected philatelist Christopher Podger gave a display of 'Cyprus Miscellany' which started with his version of 'Cyprus in Conflict' which covered WWI through to the involvement of the United Nations forces during the islands' conflicts. Issues such as Lawyers Stamps, Revenue Stamps, Use of reply coupons were covered and finishing with mail into Cyprus from an A-Z of different countries. At the recent National Exhibition and Philatelic Congress of Great Britain two members of the society plus Margaret Morris all entered material for the ASPS entry into the Interfed Competition and all three won GOLD Medals for their entries, thus winning the competition. The DDPS members who won the Gold medals were Francis Podger and David Stirrups. In the National Competition President Alan Roy was awarded a Large Vermeil for his entry and David Stirrups also won a Vermeil. At the latest meeting of the society on the 11th October 2012 local member Ron Goodfellow provided members with a very interesting display of 'Commerce in the Post' which concerned items of post relating to diverse businesses such as transport organisations and confectionery firms. This was the second part of a display Ron has put together and we look forward to Part 3 at some point in the future. Royal Mail will provide two next generation 'Post & Go' units at PERTH 2012. These units are A1 and A2 and had their debut at Autumn Stampex in September 2012. The units have a card payment terminal and take card payments only. The units are standalone in that they only need a power socket to be active, and are designed to self serve. The screen angle can be adjusted and there is even a hook for bags / umbrellas etc. In operation all activity is via a simple touch screen menu where a variety of stamp combinations can be purchased. Each unit has three reels, made up of two stamp vending reels and a large receipt reel. The stamps to be used are the Union Flag and Machin Head. Collectors may purchase individual stamps via on screen buttons or use the 'Collectors Strip' buttons to print all six price variants of the stamps on each reel. Multiple purchases can be made in the same session, each purchase can have multiple quantities. Each individual purchase receives its own receipt. An overall receipt and a credit card receipt are also printed. President Alan Roy started off the new season with an excellent display of GB Miscellany. The first part of the display included a wide display of GB stamps, and the second half of the display showed the development of the mail from 1635 through to 1840 with the inauguration of the penny post. 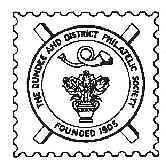 The Presidents Newsletter for Dundee & District Philatelic Society is now available on the website and can be found within the Presidents Newsletters section of the News Items on the site or by using this link. The newsletter gives a brief précis of the events of last session and a taster of what members can expect during the forthcoming session. The Association of British Philatelic Societies (ABPS) will be holding a National Exhibition in the Dewars Centre, Perthon the 19th and 20th October 2012 at which a large number of dealers will be present. At the same time as the exhibition the Philatelic Congress of Great Britain (PCGB) will be held in the Queens Hotel, Perth between the 20th and 22nd October 2012. The congress will be holding a number of talks from specialist collectors, as well as a numbver of exhibition framesand competition entries for viewing. Full details of the event (PERTH 2012) can be found on the website www.perth2012.com.